Hugely successful NEW promo product. has to be one of the best promotional products ever! The flat design allows for efficient storage and freighting. 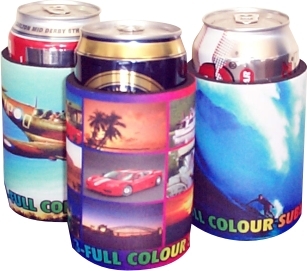 Create a fantastic impact with your vibrant full colour image and message. Available in quality 5mm neoprene. Suitable for 375ml cans or bottles. a clever idea for mail-outs, or just putting in client pocket! 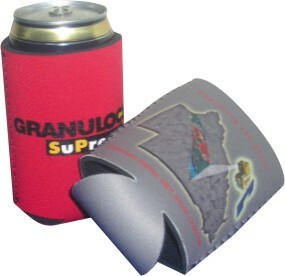 The stitched seams and 3mm neoprene allow the stubby to pack as a flat panel. have to be one of the most cost effective and targeted methods of getting your message looked at every day. 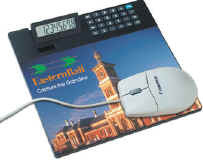 Available in a range of shapes, these mouse-friendly hard PVC surface mouse mats, feature full colour print underneath, so it will never rub off. Dual powered calculator with PVC surface mouse mat printed in full colour. Features large digit calculator, tilt display & soft rubber feel keys. Supplied in gift box. Normal production time: 14-16 days after final artwork approval / payment received. Prices in A$, GST, artwork & freight not included.